There is a general feeling that Charlotte is losing large amounts of tree canopy as a result of the city's rapid growth and associated land development. 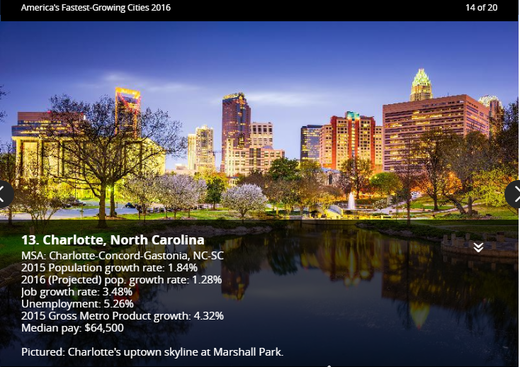 The city recently ranked 13 out of 20 on Forbes magazine's list of "America's fastest-growing cities" for 2016, based on measurements of fastest-growing populations and economies. With this high rate of growth comes high levels of development, which are often associated with loss of trees and tree canopy. Charlotte is ahead of many cities by having a tree protection ordinance in place. This ordinance contains mechanisms and requirements for the preservation of tree canopy during development. The question is: how effective is this ordinance? What impact does it have, or will it have, on meeting the city's canopy goal. There is a sense that canopy losses are substantial, (see What's at Risk), and that the rate of canopy loss needs to be slowed via a stricter ordinance with higher preservation requirements. However, solid data will be required to realistically make the needed protection policy changes in Charlotte. To do that, an updated tree canopy assessment (UTC) study (one that includes significant change analyses) is required. Where are the largest losses happening and why? How many developed sites are paying in lieu of meeting Tree Save requirements, and where are those funds being used? What is the actual canopy impact of this option? How has the canopy changed 5-10 years after development of sites that have met the Tree Save minimum? Is the Tree Canopy Protection Program (use of tree save funds) resulting in substantial canopy preservation compared to lost canopy in development? What are the future growth trends for the city, and what does that mean for future tree canopy? What is more impactful - requiring preservation as it is now or planting new trees? Are there changes in needs across the city, and thus should canopy requirements differ across different regions of the city? These questions will help answer the ultimate question: How impactful is the existing tree protection policy? What should be adjusted in the policy? While it is important to consider how other cities approach their tree protection policies, Charlotte's primary focus should be its own policy and whether that policy helps the city reach its goals (in this case, 50% by 2050). Further relationship building between the development community, the City of Charlotte, and TreesCharlotte will also be greatly improved through implementation of further study. The Charlotte Homebuilders Association recently passed a resolution to form a subcommittee on this topic, which can open the door for discussions. This group should be included in the assessment process. Form a Development Study working committee to explore these issues. Craft thoughtful scope for comprehensive tree canopy assessment update and change analysis. Include the development community with proposed analyses to help identify holes or issues in advance. Davey can assist in crafting scope. Ensure that the next canopy assessment includes the right pieces to provide valuable findings on which to base future changes. After studies and analyses are completed, review findings and identify potential policy changes that will affect the greatest change in canopy losses. Pursue any adjustments to tree protection policy based on study findings. Lexington, Kentucky is well known for it's rolling hills and iconic horse farms. But it hasn't maintained that identity without struggle. With the post-World War II surge in manufacturing and suburban expansion, city leaders started to see huge losses in the famous farmlands surrounding the city. To preserve city identity, an urban growth boundary was created in 1958 (the first in the nation) to deliberately preserve Lexington's signature horse industry (Lexington 2016). Not only did the growth boundary preserve farmland, but many believe it also nurtured vibrant urban neighborhoods. While cities without growth boundaries continued to expand in sprawl, abandoning areas in decline for better newer development, Lexington was forced to perfect infill and redevelopment projects. This unexpected outcome has produced unique results. Some of those once-neglected areas are the sites of infill projects that would otherwise not exist were it not for that fact that development subdivisions and strip malls on Fayette County farmland was restricted (Eblen 2016). In 2008, Louisville was identified as one of the top ten fastest growing cities in the country. It was also identified as one of the most intense urban heat islands , which has significant implications for public health. A Natural Resources Defense Council 2012 study estimated that 39 people die every summer in Louisville from heat-related causes. These Louisville deaths represent 6% of the heat-related deaths in the US for the entire year, despite having only 0.2% of the US population (Peterson 2014). These studies triggered an urgency for change in Louisville. To combat the projected increases in heat-related deaths, the city’s 2013 sustainability plan called for a multi-year tree canopy assessment to identify which areas were most at risk. Tree canopy assessments were completed for 2004, 2008, and 2012, revealing that Louisville was losing approximately 820 acres of tree canopy each year. Since the assessments, real changes have been occurring in Louisville. The city has consolidated departments that care for trees and hired an urban forester. A non-profit was formed and started working on more stringent development requirements and exploring incentives for commercial buildings to install green roofs (Peterson 2014). For more information, download Louisville's full Urban Tree Canopy Assessment (PDF). Building on the achievements of the last eight years the Greenworks program was updated November 2016. The City advanced Greenworks’ vision by using trees to reduce urban heat, coordinating tree plantings to include maintenance as part of routine work, rebuilding community infrastructure, including green infrastructure into future district plans, expanding the tree inventory to include information on tree health and species, and incorporating tree planting in street construction. Read the full Greenworks 2016's progress report (PDF). In 1987, the City of Lake Forest, Illinois spearheaded revisions to their tree ordinance in response to an incident on one lake front estate. Seven acres were clear cut of all trees on the estate owned by the actor Mr. T, comically dubbed by the owner as the “The Lake Forest Chain Saw Massacre,” after the removals caused public outrage. At the time, the city had the ability to prohibit mass removal of trees on newly developed land only - not on existing estates. In response to public outcries, the city passed a tree ordinance that prevented developers and homeowners from removing trees on private property without a permit. The purpose of Lake Forest’s Tree Preservation Ordinance today includes preservation of trees on both public and private property, and the inclusion of replacement planting requirements. Today, Lake Forest is revising its ordinance once again thanks to the threat of the emerald ash borer. It has been updated to reflect the need of controlling risk created from dying/dead ash trees on private property. Just like Dutch elm disease, ash trees infested with emerald ash borer are public nuisances and removal is required. The City of Lake Forest plans to reforest trees lost where possible with a diverse mix of species on public and private property. See how Grand Rapids is managing and enhancing their urban forest on their Urban Forestry Project website. ​Next Action Step: ​Improve Communication and Education.